I'm thinking that if we make it through one chapter book a month this year, Bookworm1 and I will be doing quite well. I started out the year with higher hopes but I think I over-estimated our abilities. As I mentioned, Bookworm1 (age 4) still really isn't into the idea of a chapter book although he can follow along and seems to enjoy stories once we're into them. He just complains that they are "too long." The stories aren't compact enough. So I try to keep an eye out for shorter works, generally on the topic of animals (our favorite subject) and offer incentives to keep going which makes him quite agreeable in the end. Usually I pick out a few titles and give him an overview of each and then I let him make the final selection - that way he has some control over it and can pick the book that seems most interesting to him at the time. 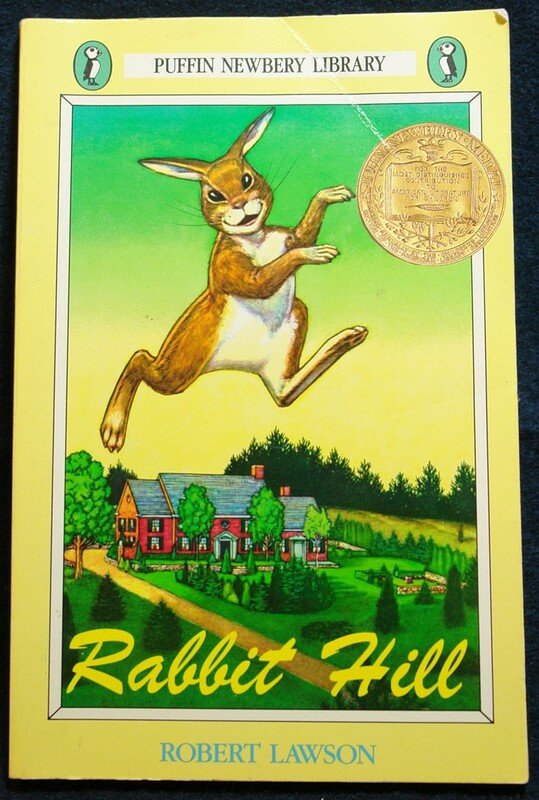 He picked out Rabbit Hill , by Robert Lawson, for our last read. Honestly, I wasn't sure we'd make it through. Grant it, it is a shorter chapter book (125 pages with plenty of illustrations scattered about) but the vocabulary in the book was very much above our heads. The animals on Rabbit Hill were quite a hungry lot as the people who lived in the local country house had moved out of it. However, they soon receive news that "New Folks are Coming!!" and there is a great deal of speculation over whether or not the new folks will be kind to the animals. Will they have a garden? Will they set traps? Will they have an old-fashioned garbage can for Phewie the Skunk to raid at whim and pleasure? There is plenty of talk and chatter as the animals hopefully watch as a new lawn is laid and a large garden built in the house of the new folks. As you can see -that's a bit over the head of a four year old! I contemplated setting this book aside but instead decided to continue reading it with explanations, definitions and frequent rewording of the passages as I read along. It made for a tricky read-aloud to the point where even I wasn't very excited about reading it because it took so much fast work and effort on my part to make it approachable. Am I sorry that we read it? Well, in a way. I don't think he would be excited to find me pulling the book out again and it will be many, many years before I will be able to do so. Perhaps before I even want to do so again. I think this story is most definitely suited for ages 8-10 in that it would be far easier for them to read the book as-is and understand it. However, the animals and subject matter makes it appropriate for 4-7 year olds. It is most definitely read-aloud material though if you read it earlier than eight, in my opinion. 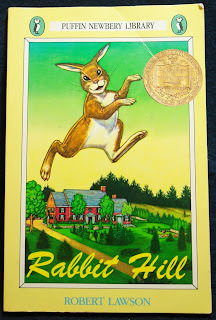 Rabbit Hill has the distinction of having received a Newbery Award and is definitely worthy of it. You just have to take care to present it to your young reader at just the right time and manner to make sure it is adequately appreciated. I'm not sure how well I did my job but we gave it a go and were both happy to have read it. During this book I frequently stopped to make sure he understood the plot, and I also stopped to define certain words that I thought were within his powers of usage. I used silly voices and tried to play up the characteristics of various characters. I think we'll try for something more simplistic for our next read-aloud but for now, we're just happy to have finished this one! For more ideas of books you can read aloud with your kids, visit Amy at Hope is in the Word and see what others are reading! I haven't read that in years! I really want to read all my old favorites from when I was a kid. :) is that silly? Oh the giveaway for the Schleich Animal Toys has started so enter!!! I know you love those toys! I was so hoping that you would have introduced us to a LONGER chapter book, but this one will wait a while. We are having such success with Arnold Lobel that I just keep going back to him and similar super short chapter books. Shameful, huh? I'm sure we'll eventually get around to this one, and I appreciate the warning about the difficulty level! Love Robert Lawson. As you know per my comments about Mr. Wilmer. I haven't read this one. Have you tried reading the original Pooh books? They're chapter books but a little easier than what you described here! Also, Beverly Cleary's Henry and Ribsy books are fun and easy for read aloud.